My grandmother taught me that anything with too much stretch wouldn’t sew properly with her machine, which may be true because it is vintage and lovely but my new Pfaff on the other hand, can be manipulated just right to sew knits. 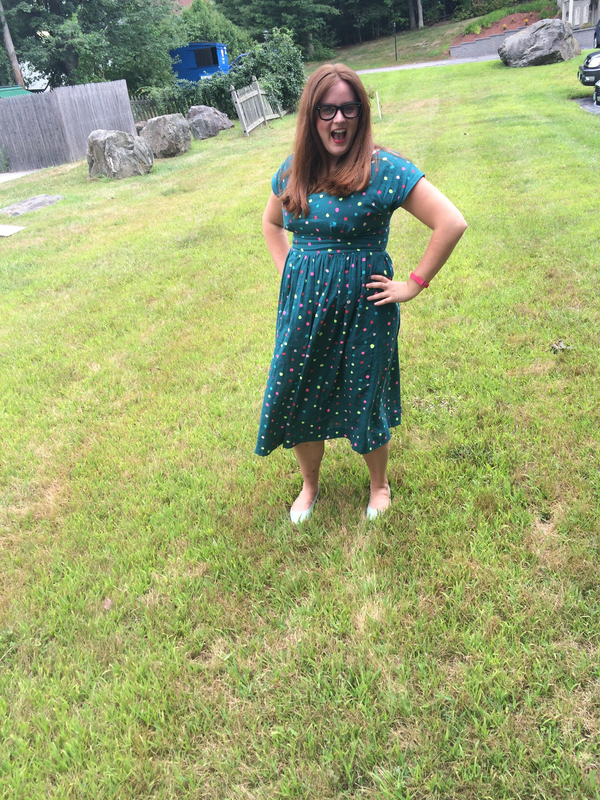 When I saw the Moneta pattern that was released with the book, I was smitten. 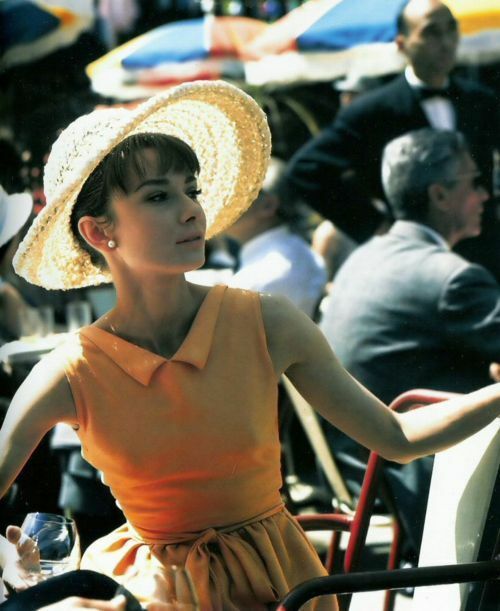 It reminded me so much of a dress worn by Audrey in Paris When It Sizzles. The collar, the gathered skirt, je vais le prendre! To me, this is a prime example of a staple garment that will never be out of style. Being my first time sewing with a knit, I decided to make my Moneta during a class offered by my favorite sewing store, Grey’s Fabric & Notions. 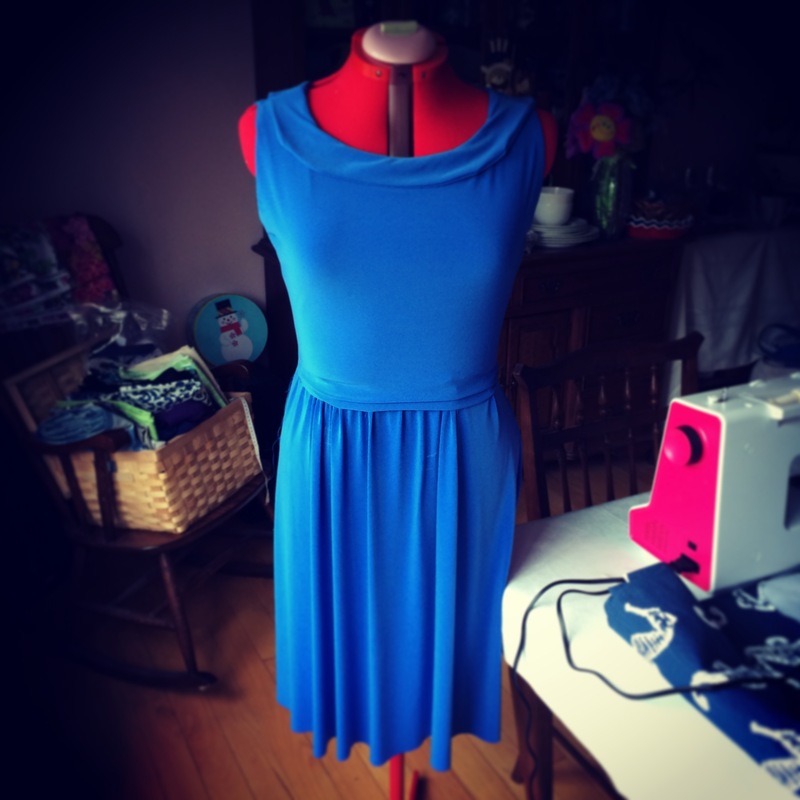 My sewing machine came from Grey’s so Sarah, my teacher and owner of the store, showed me how to use my Pfaff for knits instead of using an overlocker or serger. Pinned together after my first class. She had been experimenting with the Moneta and had already completed 1 and made a huge dent into a second before my class started so I knew she would steer me in the right direction. We opted for a traditional gathering of the skirt instead of the clear elastic method that I’ve read has been many peoples least favorite part to this garment. It was actually my first time making a gathered skirt so it was quite fun. As functional as pockets are, I tend to not make them because I don’t like extra attention called to my hip area so my blue Moneta is pocket free. My biggest problem with this dress was all to because of the fabric I chose. This was my first time working with a knit but I had some in my fabric stash from before my nana told me we wouldn’t be using them with her machine, so I took advantage and used some blue for Moneta. While a lovely color that is super soft on my skin, this fabric was ve ry shifty and I had to re-do a few pieces of this dress because of the way it moved as I sewed. My fabric also didn’t really have a right and wrong side, one side was a tiny tiny bit duller but you could really only tell when you held it just right in the light. Its a little more obvious now that one part of my collar is a different shade than the rest but maybe I’m just being too critical and no one will notice. The first time I wore it was a little chilly so I paired Moneta with my jean jacket and think they looked nice together. Just check out that collar and those gathers, I’m really proud of the construction and love the color and feel. 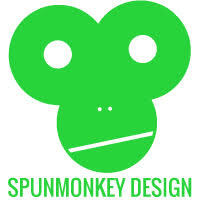 I can’t wait to make some more! I got some fabric on sale for $3 a yard that I was going to use for my short sleeve version but as I’ve learned with fabric shopping online, the fabric that arrives may not be what you imagined. This particular fabric seems more suitable for a scarf or maybe a beach cover up. I lucked out and Fabric.com has a great return policy (I wish I had known this last year after my Fabric Failure!) so the stripes will be returned and my hunt for another version sought after in ernest. On a side note, I think I use blue fabric too often so I’m trying to branch out to new colors and some wilder patterns. I think I will keep my eyes peeled for an orange or yellow knit for my short sleeved Moneta just to add some sunshine to my everyday wardrobe. Do you have a go to color or pattern when you’re sewing? Next PostWe should make more scenes about things that really matter to us.